A beloved vacation home for many years, Ecola Retreat is tucked into a quiet corner of Cannon Beach. With Ecola State Park just up the road, this sweet house on the north end is also close to the beach, Les Shirley Park and downtown Cannon Beach. This three bedroom, two bath home has plenty of amenities to spare. The bright and cheery living room is the perfect place to relax and enjoy a movie or just kick your feet up in front of the gas fireplace. With the dining table in the same room there is plenty of space for dinner and board games. There is an opening between the dining area and the kitchen to make serving a breeze. This compact kitchen has everything you need to whip up your favorite meals. The master bedroom is on the main level. This large room has a king size bed and a cozy sitting area for getting away from the rest of the crowd. Upstairs you’ll find the next two bedrooms. 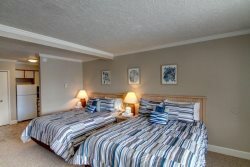 The first has a queen bed and the third bedroom has two twin beds. Tucked between the two upstairs bedrooms is a family room with a TV and if needed the couch pulls out for additional sleeping . There are two bathrooms , one upstairs and one downstairs. Ecola Retreat has two outdoor areas for you to enjoy. A covered deck on the north side of the house has a wooded view and outdoor furniture for al fresco dining. On the south side of the house there is a patio with a portable fire pit and Adirondack chairs, which makes the patio a wonderful spot for star gazing at night. If you are really lucky some of the neighborhood elk may come wandering by. King bed, Queen bed, 2 Twin beds and a Queen pullout sofa. I love the Oregon Coast any time of year and this house is a perfect location for warm and cozy winters and privacy in the summer. Easy access to hikes in Ecola State Park, Chapman Beach (which is prettier and less crowded than Cannon Beach) and a short walk into town to shop or dine. The house has all the amenities you need with comfortable beds and nice linens and private outdoor space to soak up sunshine in the garden or listen to the birds sing on the deck. We enjoy hanging out by the fire pit roasting smores and star gazing. What sets this house apart from other beach rentals is the decor. Lovely paintings, nice furnishings and very clean. It is just the right balance of beach, cottage and comfort. Our families had a great time at Cannon Beach ! Thank you for sharing your home - it was perfect. Enjoyed the hikes & sights of one of the most beautiful places on earth. Thank you! Wonderful home! Enjoyed the cozy fireplace and colorful decor with original art work. Hike between Ecola and Indian Beach was awesome despite gale winds! 2 evenings went to Ecola Park to see elk grazing. Have not stayed at north end of town before so enjoyed the new scenery. Another terrific stay on the Oregon Coast. Thank you!! With your warm and generous hospitality this place shines. Warm, cozy and yummy - great job. A perfect retreat! Thank you.